World No1. Andy Murray poses with his first ATP World Tour Finals Title. 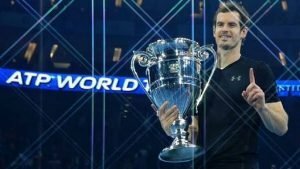 World No.1 Andy Murray capped off a phenomenal 2016 season by winning the ATP World Tour Finals, winning the season ending tournament in sensational style, handing rival Novak Djokovic a 6-3, 6-4 defeat. Murray in the process, won his first World Tour Finals title, and improved his career best winning streak to 24. And top it all off, Murray became the first Brit in the Open Era to finish as World No.1 in the rankings. The updated tennis odds changed quite literally ever since Murray occupied this prestigious position. The match began, as Djokovic got off to a flyer, winning his first nine service points. However, it was the sixth game in which he was truly tested, when he was forced to save a couple of break points. However, with strong baseline play, and a series of errors from Djokovic’s backhand wing, Murray grabbed the opportunity in Djokovic’s very next service game, breaking him to gain a 5-3 lead, as he went on to serve out the first set. Murray carried his momentum into the second set, breaking Djokovic in the first game of the second set, as Djokovic’s error woes continued. 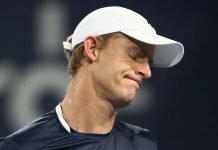 To add salt to his wounds, Murray broke back once again in the fifth game and despite consolidating a break, would serve out the match to wrap up victory in an hour and 42 minutes, as a Djokovic return of serve sailed wide. An ecstatic Murray raised his arms in celebration, as the vocal home crowd cheered on. 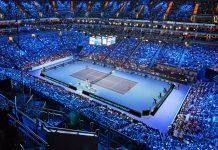 It was their first meeting since the French Open Final, and sweet revenge for Murray, who lost the former, as well as the Australian Open Final to Djokovic this year. Ending the season with a 78-9 record, Murray seems to be hitting the right notes with coach Ivan Lendl, who previously guided him to victories at the 2012 US Open and 2013 Wimbledon. With a Wimbledon Title (d. Raonic), three Masters Titles, a World Tour Finals Title and the Year end No.1 ranking, the second half of 2016 rightfully belongs to Murray, just the way it could be said for Djokovic in the first half. Having created history at home, Murray finally has come to justify his presence in the Big 4, and hopefully, there is more in store, when we see him play the next time.